I just posted a summary of a message on Isaiah 40 on the Cor Deo site. If you haven’t seen it, let me share a few thoughts here first. In simplistic terms, the section preached focuses on the greatness of God and the graciousness of God. I think there are two easy mistakes to make here. 1. To focus purely on the greatness (since that is the focus of vv12-26, the majority of the text). I think this can lead to an impressive presentation of theology, but a weak message in terms of what is needed. Not only by listeners today, but also in respect to the original intent of the passage in light of the first verse – to offer comfort. 2. To simple offer two paradoxical truths. Two things about God. He is great. He is gracious. Two points. And potentially, two messages. Simply balancing the two sets of truths is better than mistake number 1, but it is still not engaging with the text in terms of what the author was trying to achieve. As you read the summary you won’t see all the illustrations and applications made in my preaching of it, but you will get a sense of the flow of the message. In particular, you should see how I addressed the greatness and graciousness issue. One further thought. I think it is important to see the flow of a text. I have heard this passage preached, actually, I think I have preached this passage, as a selection of theological truths to pluck and present. It makes for a lot of positive feedback, but I don’t think this approach really honours the text God inspired Isaiah to record. 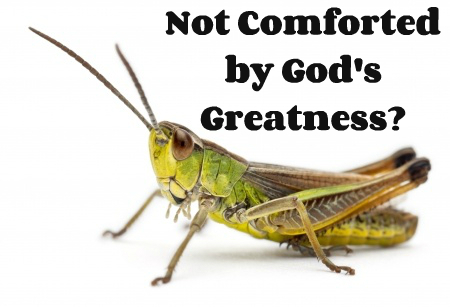 Enough for now, here’s the link to the post: Not Comforted by God’s Greatness?